Thanksgiving will be here before you know it. 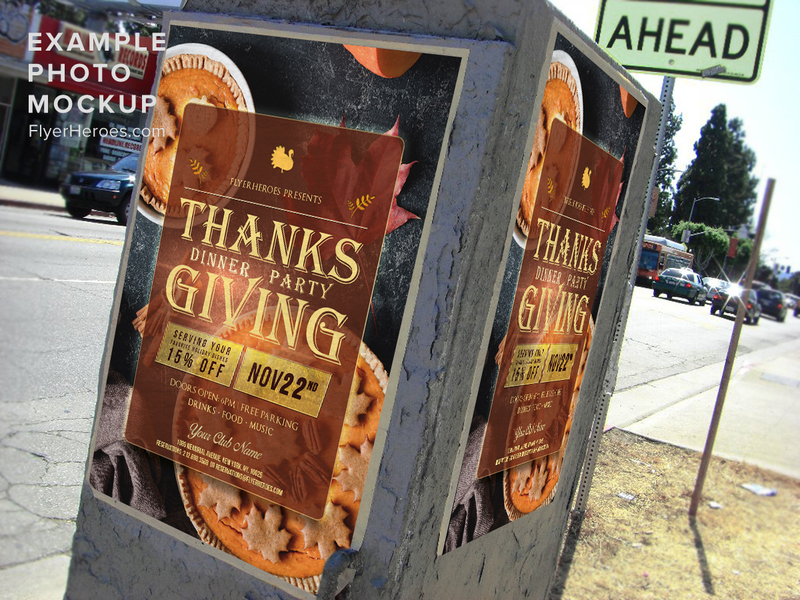 Now is the time to promote your Thanksgiving Day Dinner in a big way. 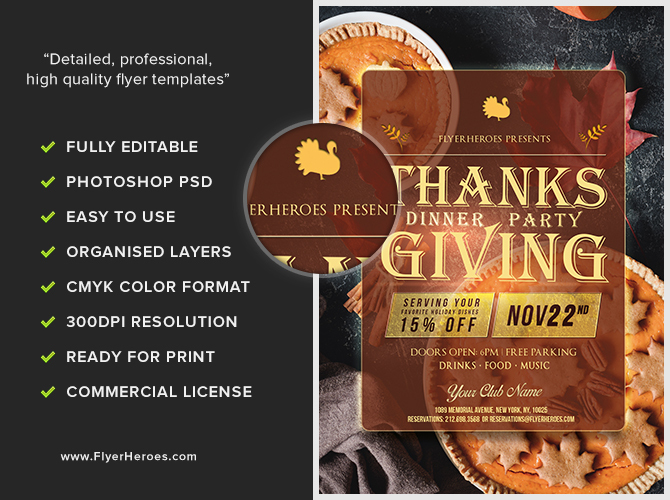 This professionally-designed template will get your promotion rolling along in less time than it takes to prepare a Thanksgiving Day dinner. 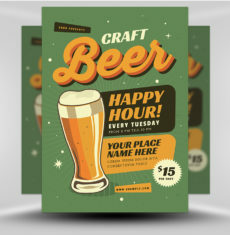 Forget about fussing with graphics, formatting, and design. Simply plug in your promotional information and go! Place stacks of flyers around town – in free newspaper boxes, in community centers, libraries, colleges, and more. 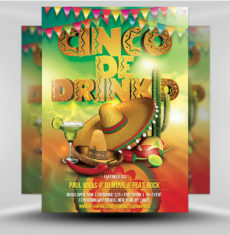 Hand out flyers, orange balloons, and free imprinted leaf-shaped coasters in front of busy stores and restaurants. 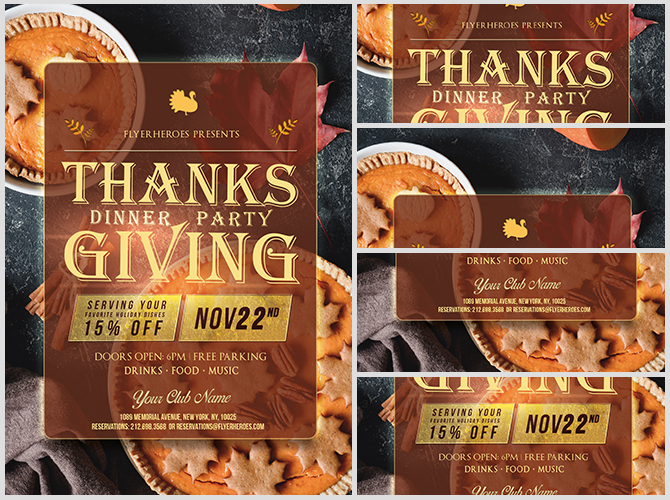 Mail out flyers and Early-Bird Special coupons in envelopes imprinted with an elegant autumn leaf design. 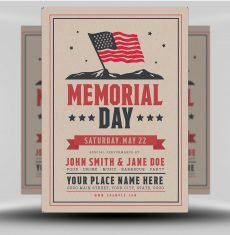 Create a postcard (using the digital image) to pass out or use in an email blast to email subscribers. 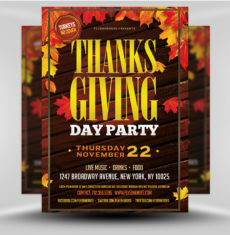 Use the flyer’s image to create pre-Thanksgiving Day posts on your social media platforms. 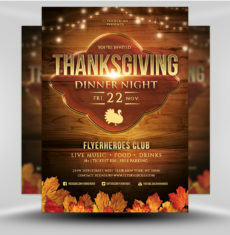 Insert the flyer’s image into Thanksgiving celebration Facebook boosted posts or paid advertisements. Place flyers in residential mailboxes and on car windshields in local neighborhoods. 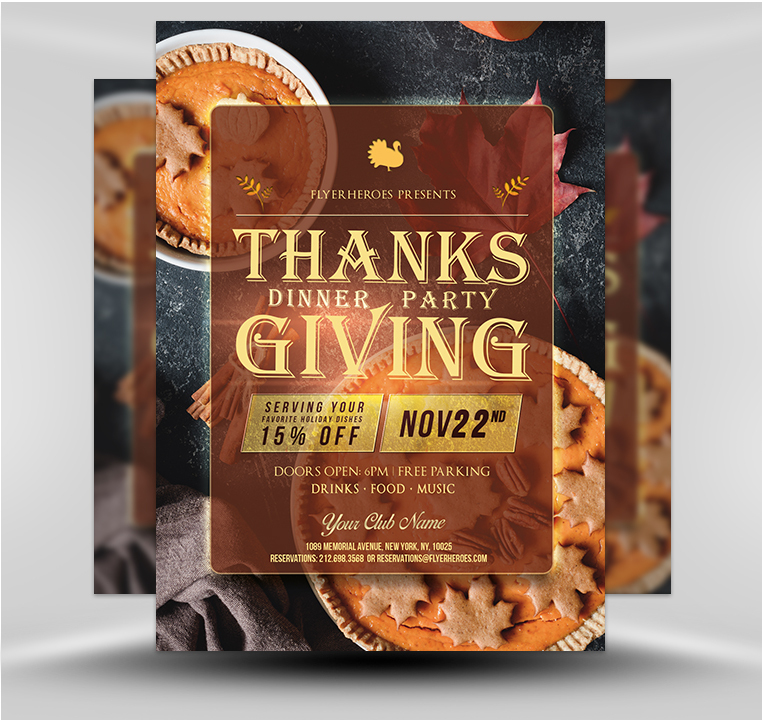 Use the flyer to create a print circular or newspaper ad to run before Thanksgiving arrives. Post the flyers on public bulletin boards around your local area. 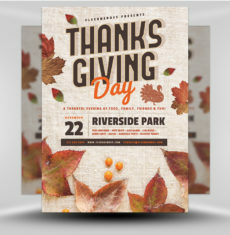 Create a print newsletter filled with Thanksgiving Day trivia and dessert recipes to mail out to local residents. Include the flyer with a discount code in the newsletter. 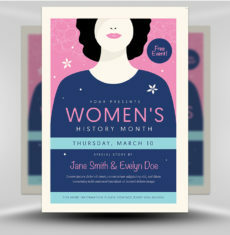 What Fonts Do I Need? 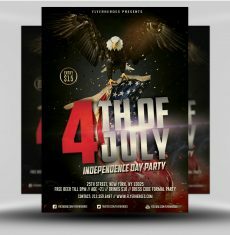 This flyer template is a premium Photoshop PSD flyer/poster template designed by FlyerHeroes to be used with Photoshop CS4 and higher. 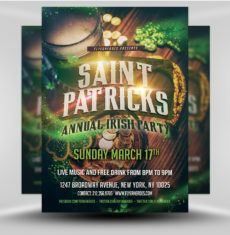 Once you have purchased this flyer template, you are free to make any customizations and modifications you’d like. You are also granted an unlimited use and 100% royalty-free license, meaning you can use this product as many times as you wish. 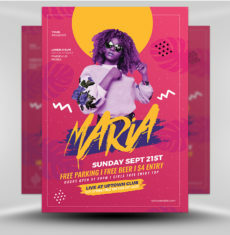 You are free to use this product in both personal and commercial work. You can read more about our file licenses here and our file requirements here. Please note, stock models/photographs of people are used for demonstration purposes only and are not included in the final download. 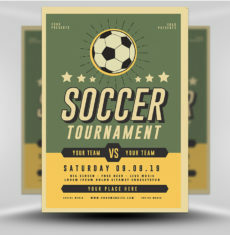 We do however include a blank placeholder layer to make using your stock photos as easy as possible. 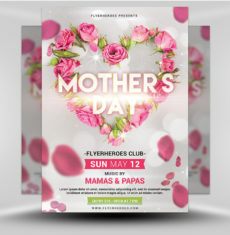 If you have any further questions, please feel free to direct your questions to FlyerHeroes Support. if you are unhappy with our service. That's a bold statement. 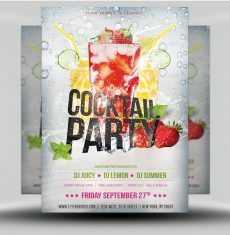 We provide royalty free & premium Photoshop PSD flyer templates for nightclubs, businesses, community groups and more. 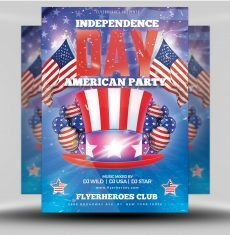 If you have any questions about FlyerHeroes or our products, please don't hesitate to get in touch.